Some time ago, Geldof had the pleasure of receiving a new order from a prestigious refinery in Antwerp. 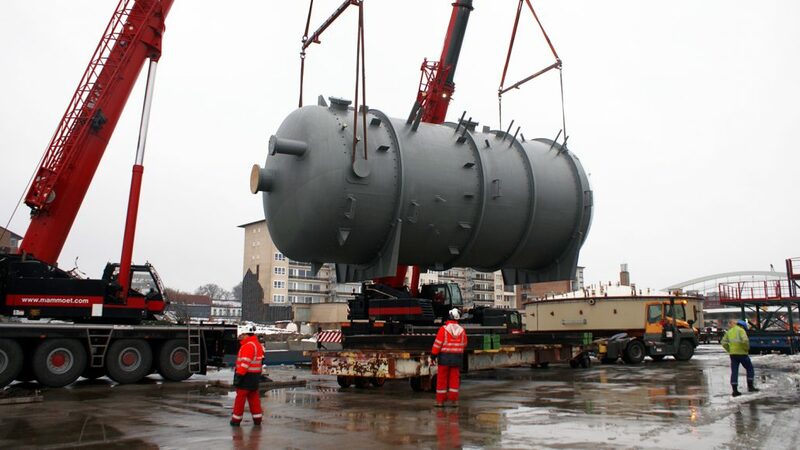 After successful collaborations for previous construction projects, the customer decided to entrust us with a pressure vessel. The order: the engineering and fabrication of a new top part for an existing Crude Oil Distillation Tower. Weighing in at 45 Ton, this piece has a diameter of more than 5 m and a cylindrical shell height of around 11 m. The material of choice: carbon steel with a 3 mm cladding made out of Hastelloy, a cobalt, chrome, nickel and molybdenum alloy. Though very hard and therefore requiring specific know-how to process, its high resistance to high temperatures and corrosion made this material ideally suited for this project. Our contract included delivery of the piece at the customer quay with internals pre-installed in our workshop. Ladders and platforms were trial fitted and delivered separately. In spite of meticulous preparation, shipping turned out to be a nail biter. Melting snow made the river water rise to the highest level of the year, making the passage under the bridge of Ooigem-Desselgem extra suspenseful. After some tense moments, the rest of the journey went smoothly and the part was delivered before the holidays. Recently, the top section was transported to the erection zone and placed vertically for predressing. Talk about delivering under pressure!